As a British Standard only (rather than an adopted European or International standard), BS 6229 concentrates on flat roof construction in the UK. It describes best practice in the design, construction and maintenance of cold, warm and inverted flat roofs with a fully supported, flexible waterproofing layer. Like any British Standard code of practice, the contents of BS 6229 are guidance and recommendations only. The flat roofing industry collaborates to produce this standard, and the guidance therefore carries weight. Any claim of compliance, however, should be made with care – and any deviation from the recommendations should be justified if design and construction work is suggested to be compliant. What is the current version of BS 6229? The previous version of BS 6229 was published in 2003. The 2018 version acknowledges that many changes have since occurred in how buildings are constructed, and how waterproofing materials perform. BS 6229:2018 therefore represents a comprehensive and wholesale review of the guidance. To avoid the duplication of information, BS 6229 no longer gives detailed information on condensation risk, workmanship or acoustics. Instead, it points readers in the direction of other standards specifically addressing those topics: BS 5250, BS 8000-4, and BS 8233 respectively. What roof constructions does BS 6229 cover? Hot and cold liquid applied roofing. Four types of roof system are recognised: warm flat roofs, inverted warm flat roofs, cold flat roofs, and uninsulated flat roofs. Reference is also made to hybrid flat roof constructions and the heightened risk of condensation for which they can be responsible. While BS 6229 does not say outright that hybrid roofs are not recommended, it does make clear that designers “should select the type of flat roof most suitable for the intended building”. What other areas of roof design feature in BS 6229? Drainage and minimum falls is a critical aspect of flat roof design. To aid good detailing, not only does BS 6229 state the falls that should be achieved, it also includes typical level access designs for the different roof systems. Comprehensive guidance on flat roof thermal performance is offered, including how point thermal bridges should be treated when they prevent a continuous insulation layer being installed. A separate section is given over to the correction factors applied to inverted roofing (which we discuss in more detail in this blog post). Green and blue inverted roofs feature in their own short sections, including advice not to take into account any thermal performance of growing mediums for green roofs. A short section introducing the topic of condensation risk analysis includes a recommendation to use an external temperature of -5 deg.C for 60 days during the heating season to allow for the cooling effect of clear sky radiation. While this has been a feature of the standard since the 1980s, awareness of it appears to be limited and is arguably not common practice in the industry. 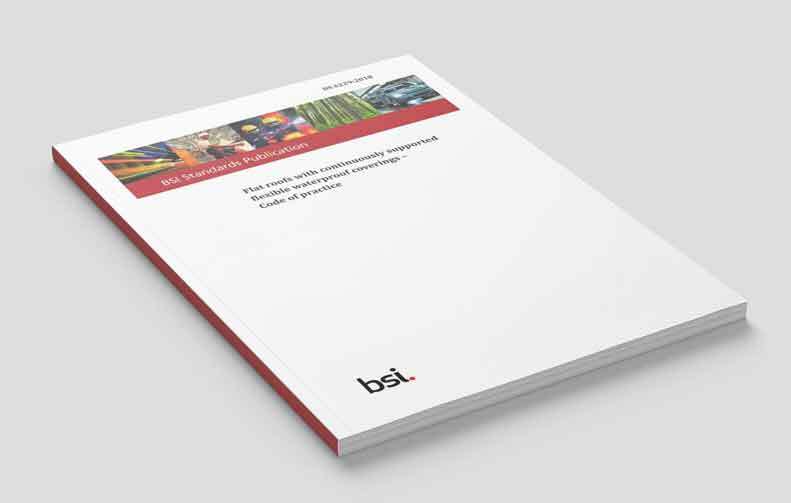 Guidance on design issues concludes with sections on surface protection – which also addresses ballast for inverted roofs – and rooftop installations such as plant. The remainder of BS 6229 lists commonly used materials for the roof structure, waterproofing, thermal insulation and vapour control layers, and gives standards and other applicable guidance to which they should be manufactured or prepared. A short section about workmanship highlights some of the ways in which roof coverings can fail, and briefly describes how roofing materials should be cared for on site. Finally, a section on roof inspections and maintenance describes how best to ensure the roof system achieves its service life, and the role that a building information manual can play. To discuss BS 6229 and roof system design in more detail, and how Polyfoam XPS insulation can be part of the roof system for your project, contact our technical helpline on 01429 855120, or email technical@polyfoamxps.co.uk. IS PRICE STILL THE DRIVING FACTOR ON CONSTRUCTION PROJECTS?